Our fudgy brownies were waiting for this salted tahini cream cheese swirl their whole lives — yours too? After seeing the gooey goodness atop these chocolate brownies, not sure we want them any other way again. You know how a rich tray of chocolate brownies is juuuust fine on their own? We, like you, didn’t need them to be one single crumb fancier. However, after seeing the gooey goodness atop these chocolate brownies, we were intrigued (read: hypnotized). And after making a tray of your own and swirling on a tahini cream cheese topping, we bet you’ll be as satisfied (read: obsessed) as us, with your new go-to brownie recipe. 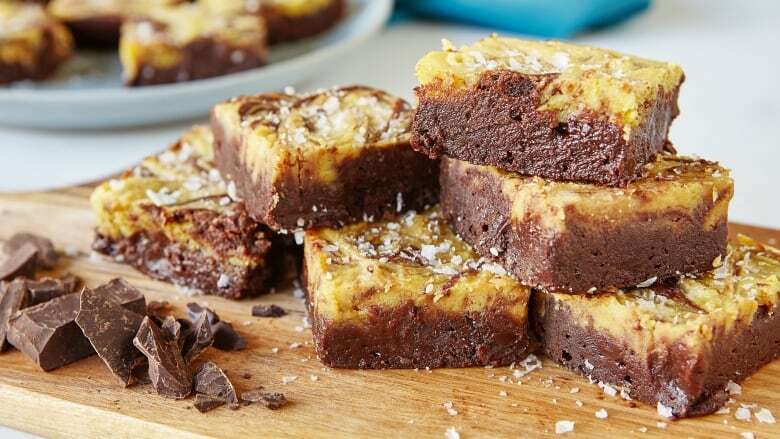 These fudgy brownies with a tahini cheesecake swirl are finished with a sprinkle of flaked sea salt for decadent indulgence. Use an 8-inch square pan for the recipe below. For a 9-inch square pan, adjust the bake time to 25 to 30 minutes. Beat the cream cheese until smooth. Beat in the sugar until the mixture is light and fluffy. Beat in the tahini until blended. Beat in the egg yolk until it is incorporated. Beat in the lemon juice until combined. Preheat the oven to 350F degrees. Grease an 8-inch square baking pan and line with parchment paper so it overhangs at the edges; set aside. Sift together the flour, cocoa powder and kosher salt; set aside. Melt the butter and chopped chocolate in a heatproof bowl set over barely simmering water, stirring occasionally. Remove from heat and stir in the sugar. Cool slightly. Stir in the eggs one at a time, until well combined. Stir in the vanilla. Fold in the flour mixture until combined. Scrape the brownie batter into the prepared pan and then smooth the top. Drop tablespoons of the tahini batter randomly over top, then swirl the batters together using the tip of a knife or a skewer. (Don’t over think the swirl when mixing the two batters together. Let your inner artist guide you.) Sprinkle sea salt evenly over top. Bake until only a few moist crumbs stick to a toothpick when it’s inserted into the centre of brownie, about 30 to 35 minutes. Cool completely in the pan, on a wire rack. Cover and refrigerate until firm, at least 4 hours, though overnight is best. Using the parchment paper as handles, lift and transfer to cutting board. Cut into 9 large or 16 small squares. Best served cold. Cover and store refrigerated for up to 3 days or freeze for up to 1 month.